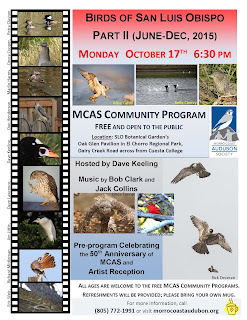 What: Birds of SLO County 2015, Part 2 (July through December) by Dave Keeling. Reception begins at 6:30pm, slideshow starts at 7pm. Dave Keeling will once again host this program, one of MCAS's most well-attended annual programs! The presentation will consist of beautiful images of birds photographed in our county in 2015 by many of our finest local nature photographers. 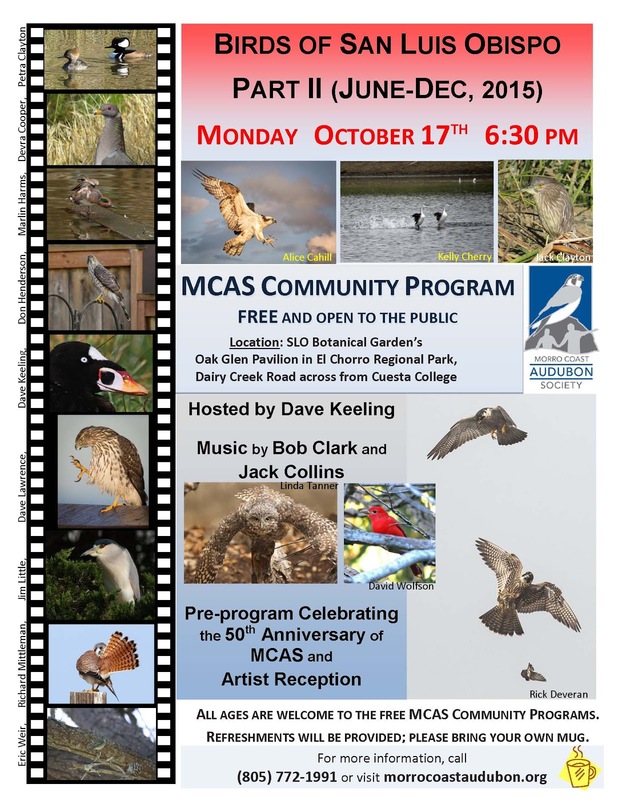 A reception to Celebrate MCAS's 50th Anniversary and to meet the photographers will precede the program at 6:30pm. Cake and sparkling wine/cider will be provided (along with glasses/plates/etc.) to toast the 50th and celebrate! Guitarists Jack Collins and Bob Clark will once again accompany the presentation. MCAS Community Programs are presented on the third Monday of each month, at the San Luis Obispo Botanical Garden Oak Glen Pavilion, in El Chorro Regional Park, on Highway 1 across from Cuesta College.